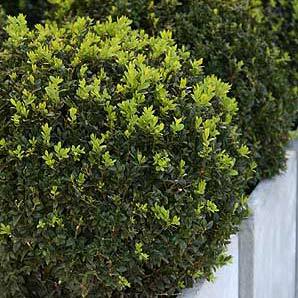 Buxus Hedges or ‘Box Hedging’ are some of the most popular low growing hedging plants for sale in Australia. They are a hardy easy care group and with many varieties to choose from that will suite different applications and climates. Box hedging species are widely used in Parterre Gardens. The most commonly grown variety is Buxus sempervirens or ‘English Box’, and Buxus microphylla. The term “Japanese box hedge” refers fo Buxus microphylla japonica ( Japanese Boxwood ) a fast growing species. If you can find it Buxus sinica var. insularis ‘Justin Bowers’ is a form that naturally grows to form a rounded ball, an interesting specimen in a container. This is one of the most commonly used hedging varieties, with its tight structure informs a tight barrier and is used widely for low hedges. Reasonably drought tolerant once established, although potted specimens need to be kept moist. If you are looking for hedging plants, you want multi stemmed bushy plants that are the same height. Topiary plants usually require a single stem. Work out how many you need. Generally for hedging you will need 5 plants per metre if using smaller tubestock or bare rooted plants. For a faster hedge, using advanced potted plants, 3 – 4 plants per metre will work. Dig over the soil before planting, add some compost and aged cow manure along with a little blood and bone. Use a string line to ensure a straight hedge, measure out you planting distance and set the plants out. Once this looks even, dig the holes, plant and backfill. Plant right up to the lowest branches to ensure a hedge without gaps. Mulch around the plants to n=maintain a cool root run. Prune back to an even height and width in winter. Hand clipping is best as it gives a nice clean cut, electric or petrol driven shears are quicker but can tear the plant. Fertilizing a box hedge it really fairly simple, in autumn some liquid seaweed fertilizer can be applied followed by some slow release ftype. Try to make sure that fertilizer is applied just outside the dripline. If the lower foliage begins to ‘yellow’ a little its a sure sign that your box hedging needs little fertilizer. In terms of other problems these tough plants are generally fairly ‘trouble free’. Instant hedging lines such as the Buxus varieties.